For almost the entire 400 years since the White Anglo Saxon Protestants took New England from its rightful owners, its houses have been restless and on the move. The first settlers were constantly moving buildings. During the Revolution residents of Castine, Maine who preferred the rule of a mad king took their houses apart, loaded them on boats, and removed houses and selves to St. Andrews in New Brunswick. 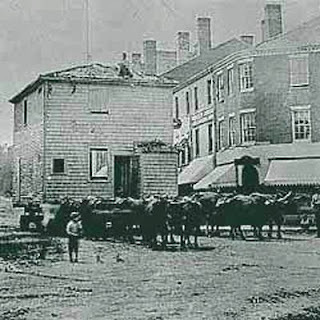 In 1845, Elizabeth Prince Peabody described a house moving she witnessed in Danvers, Massachusetts. "The building came along slowly, drawn by yokes of oxen. Every yoke had a driver beside it with goads, hurrying them with a 'Hush-whoa'. It seemed as though there were 20 or 40 yoke of oxen." In our Maine village, a number of early buildings are not in their original locations. My own house, a small cape style farmhouse built in 1814, became redundant when the family that owned it hired noted architect William Ralph Emerson to design a new house in 1895. Finding my house too good for tear down (I've since expensively had reason to question their judgment call), they simply lifted it up, put it on logs, hooked it up to some oxen, and rolled it downhill about a thousand feet, and here I sit, in a draft, typing this post. I love the stories of these restless houses, and in the next few weeks will tell the tales of four of the best. The 1806 Thomas McCobb house in Phippsburg, at the mouth of the Kennebec River, was known locally as 'the spite house'. It is a particularly elegant Federal style house, with details taken from Asher Benjamin, an octagonal cupola, and carved swags above the first floor windows. The local legend was that Captain Thomas McCobb built it to spite his mother and stepbrother, who, with manipulation, had inherited the family homestead across the road, until then the finest house in the region. Spite house remained on its knoll, overshadowing the older house, until discovered by Donald Dodge of Philadelphia. Smitten, he negotiated a purchase, and arrangements were made to move the house to his ocean front site on Deadman's Point up the coast. 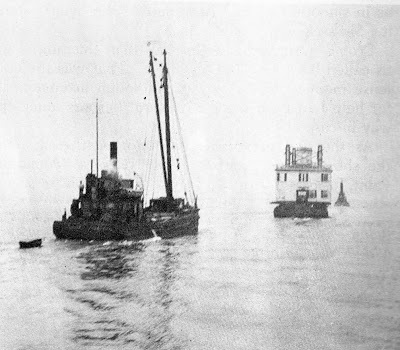 The Dresser Company of Portland was hired, the house was loaded on greased skids, rolled downhill and loaded onto a New York, New Haven and Hartford Railroad barge captained by John Snow, and the house was taken 85 miles by sea to its new location overlooking Penobscot Bay. Mr. Dodge wished the house to be moved without damage to plaster or chimneys, and over 2,000 feet of lumber was used to brace the structure for safe transport. Adding to the load were several tons of granite, including the original doorsteps and foundation coping. Upon arrival at its new site, the process was reversed, the house was loaded back on skids, and horses drew it to the new foundations awaiting it. 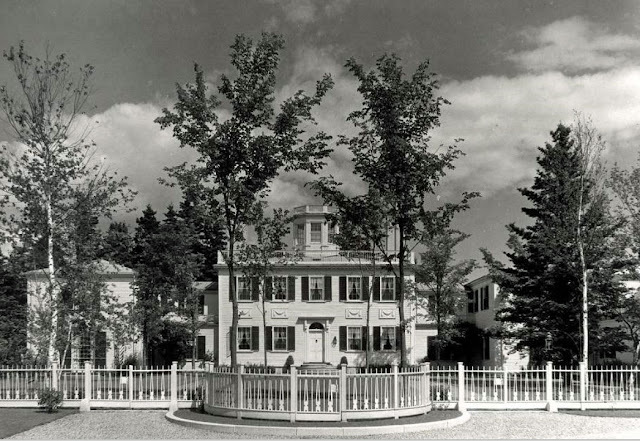 While Spite House, as it was dubbed, may have been the grandest house in Phippsburg a hundred years before, its 8 rooms were hardly adequate for the needs of a wealthy family and their staff as a summer home in the age of F. Scott Fitzgerald. The venerable Philadelphia firm of Tilden, Register, and Pepper, headed by Marmaduke Tilden, were brought in for a 'restoration' and enlargement of the house, giving it a glamorous 'past' that probably far exceeded the original. 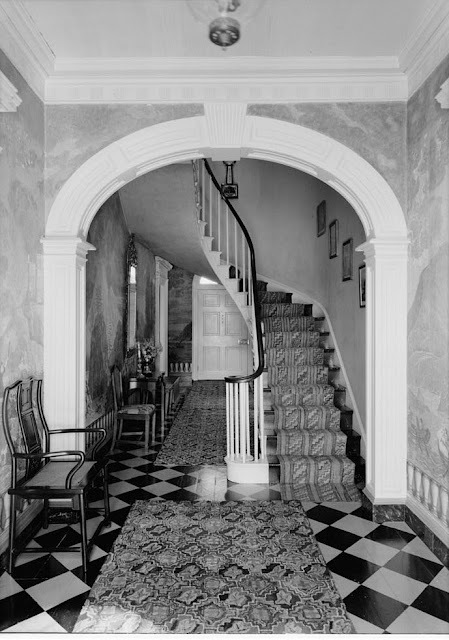 The curving main stairway was reversed, a back stair removed, and the hall extended through the house, that the ocean might be seen from the front door. Wings were added to the sides with large living and dining rooms, a gun room, ladies reception room, dressing rooms, bathrooms,, and an extensive service wing with the usual assortment of kitchens, pantries and servants rooms. For more old material, an 18th century house in Harpswell was purchased and demolished for woodwork for several rooms, including a paneled breakfast room. Mr. 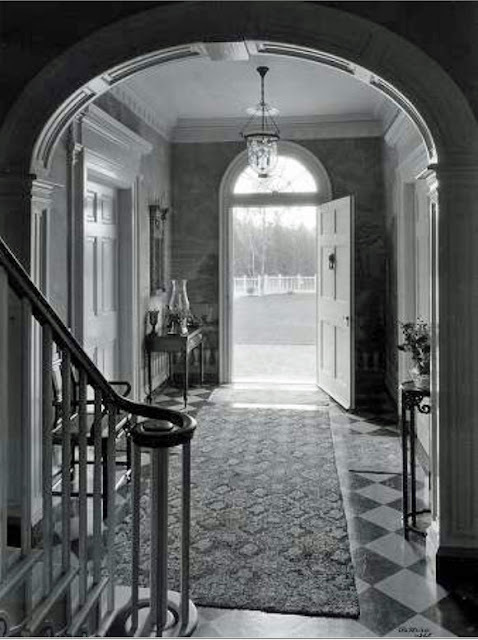 Dodge was a connoisseur of singular and bold taste, and he furnished the house fearlessly in the best Colonial Revival idiom of the day. Woodwork was carefully glazed to appear antiqued. Fragments of original wallpapers were reproduced in their original bright colors. 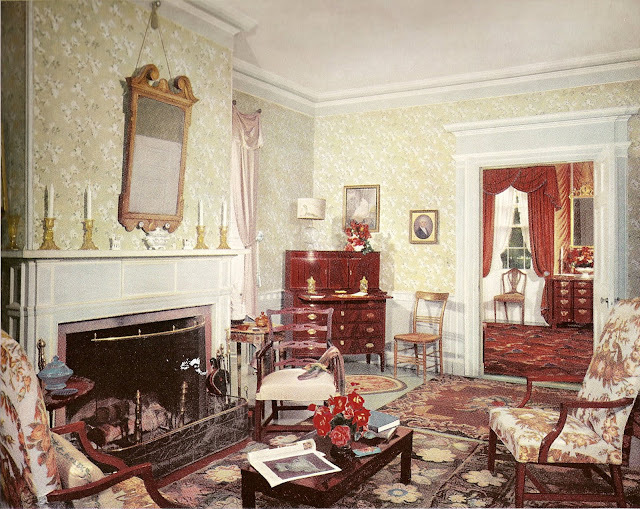 One room was papered in an orange swag pattern paper, supplied by decorator Nancy McClelland, an expert on early papers, who is thought to have had much to do with the decor of the house, with orange and green drapery to match. Painted floors and bright hooked rugs contrasted with the elegant furnishings. The new dining room, with woodwork copied from the similar Kavanaugh house in Damariscotta Mills, was particularly fearless. 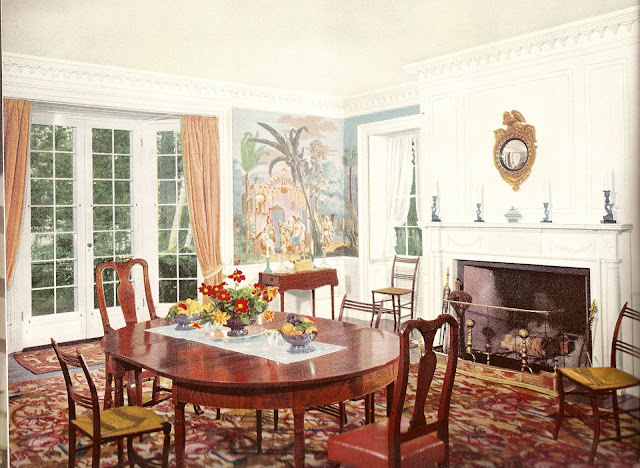 It featured a scenic wallpaper, Les Incas by Dufour, in blues with accents of red and orange, and the carpet was a Brussels woven in blues and oranges, for which Mr. Dodge had the original factory re-opened. 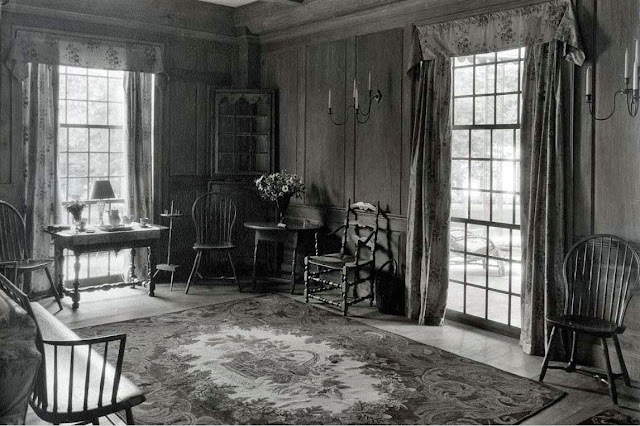 Each room, as at Henry Davis Sleeper's Beauport, had collections of accessories chosen for their color impact and light reflection. Outside, Mr. 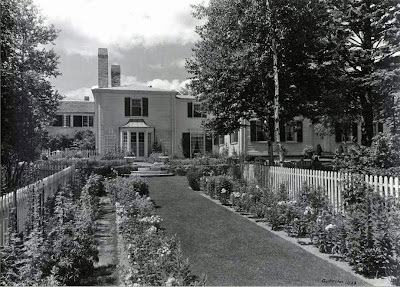 Dodge surrounded the house with elaborate, maintenance intensive 'colonial' style gardens designed by Edmund March Wheelwright, a Boston architect who summered on a nearby island. An elaborate picket fence and entrance courtyard created a suitably elegant and charming approach. Mr.Dodge intended to leave his beloved creation to the Society for the Preservation of New England Antiquities, now Historic New England, but the gift was declined for lack of endowment. The family retained the house, and shorn now of two of its wings, it remains a private house. I must admit I spent way too much time this weekend watching Haulin'House on HGTV. It looks so much more elegant with the houses hoisted up on big logs. In spite of it all...I do love the story of this house. Just think where we'd be if we moved more houses rather than subject them to the wreaking ball. Love it!! The whole damn thing... the house , the extravagance, the Col. Rev. stuff. , the floors, the fences, the servants etc....super duper story. More recently in my fair city of Gotham, Hamilton's house has been moved by the Parks Service from an undignified crowding and I look forward to seeing it once it reopens after a lengthy restoration, currently underway. PS, just as you had "happodeb" as the word verification when you commented on RD recently, mine for yours just now was conesobs. Have you ever seen a tearful pinecone? weren't there tearful pinecones in Bambi? I visited Hamilton Grange when it was crowded in behind the church, and have been following the story of its very high tech move with great interest, as I have the story of re-arranging its parts back to their proper locations. Ah, what a wonderful story. I was born in Maine, but left as an infant. somehow, it is still in my blood. Once there is an old house in your family. That's it. You're a goner. Hooked for life. This is the best post. I have to come back and reread it. What a fantastic blog. I am almost sorry I found it, as I will be spending way too much time haunting it. In those days moving a house was a very hard work and still people moved to far places wit they all belongings. thank you for posting a wonderful story. Glad to have been referred here by your latest post. just the sort of story I love. thank you DED. Wonderful story. Some people say moving house is more difficult then divorce. Moving Companies can make your moving experience less difficult. I hired Box when i was moving and I found them truly professional. But those days it was difficult to do so. This seems to be great site for home moving companies Moving Texas it provides rental trucks for moving where we can select the best one out of them for saving your time and money. I had been relying on http://heartoftexasmoving.com earlier and they too offered good stuff. Great historical post, the pictures look splendid. Useful and informing to know. If it wasn't for this post I would have never guessed. Thank you for the effort in putting everything so neetly. Ah, what a wonderful story. I was born in Maine, but left as an infant. somehow, it is still in my blood. Once there is an old house in your family. That's it. You're a goner. Hooked for life.Moving can be a real pain especially if you will do all the work by yourself. To make your life easier, you should get a reliable Man and Van service that can help you move without hassle. I do assemble ikea flatpack Bedrooms kitchens wardrobes sofas bookcases tables etc. I have My own tool box and lot of years experience in flat pack. Plus if you need to help with Painting your flat or house i can do on fix quote. Wow this is the one of the best blog. It is really very informative and very nice.Thanks for sharing.Here is a news that i want to share to all of you that is Removals in surrey. Where you can get better house relocation services. I just discovered your blog, wow amazing on your ideas.Thanks for this informative post,Awesome post sharing!Man and Van London are a relocations company based in Outer London who offer fully comprehensive removals service through out the whole of greater London offering a range of different moving services. We charge the most reasonable rates in the industry but still pride ourselves on offering a reliable and affordable Business or Home move across the UK. 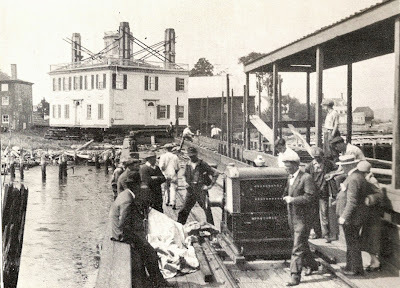 An interesting post to refer to if you want to learn more about the history of moving houses. Relocating that house through putting it on top of a kind of floating material and pulling it towards its new place is impressive! Thanks for taking your readers back to the good old times. Really interesting post and beautiful pictures as well. I am always a fan of seeing the inside of homes and the type of furniture that people have. Now its really easy to move our house with Movers and Packers Dubai company..
Hello my friend! I would like to tell you that this write-up is awesome, great written and include almost all important info. I recently came to know about http://uklocalmovers.co.uk/, their Man and Van Croydon are very effective. خدمات شركة بسمة الرياض من افضل الخدمات المميزة التى تعطى الى جميع عملاءنا الكرام وتحقق مصلحتهم اولا فاذا كنت فى اى مكان فى الرياض وتعانى من تنظيف منزلك فاعلم جيدا ان شركة تنظيف منازل بالرياض هى افضل الشركات المميزة المتقدمه فى الاسواق والتى تساعد فى القيام باعمال التنظيف للمنازل فوق اى اعتار فلا داعى للقلق من شان التنظيف الان شركة تنظيف منازل تقدم افضل الكوادر البشرية المميزة التى تساعد فى انجاز مهام التنظيف بالاضافة الى التدريب المستمر حول القيام بالتنظيف من الداخل والخارج والحصول على افضل النتائج المميزة بالاضافة الى اننا نقوم باعمال التنظيف من الالف الى الياء على حسب رغبع واحتياج عملاءنا الكران فاذا ارد ان تشعر بكل ما تتمناه من التميز فعليك ان تتصل وتتواصل معنا على الفور فى القيام باعمال التنظيف للمنازل . لا تكتفى شركة نظافة منازل بالرياض بتقديم خدمة واحدة فقط فى اعمال التنظيف بل تقوم بالبحث داما عن كل ما هو متميز من اجل ان يتم انجاز مهام التنظيف الان فنعتمد على افضل الاجهزة المخصصه فى اعمال الجلى والتى تساعد فى القيام باعمال الجلى على افضل ما يرام وازاله الشقوق والفواصل والعيوب واى شىء غير مالوف وجوده فى الارضيات بالاضافة الى اننا نقوم بتنظيف المفروشات فى اقل وقت ممكن بالاعتماد على افضل الاجهزة التى تعمل بالبخار ومن اجل ان يتم تحقيق افضل النتائج المميزة بالاضافة الى اننا نعتمد على الاجهزة التى تعمل من خلال افضل الطرق المميزة فى تنظيف بالخارج فاذا اراد ان تقوم بكل ما تتمناه فى التنظيف فتاكد ان المعدات المميزه التى تساعد فى القيام بكل ما تتمناه هى الافضل من حيث التميز. اسعار شركة تنظيف المنازل بالرياض مميزه وفى مقابل جميع طبقات المجتمع بالاضافة الى ان الشركة تعتمد على عدد من الخدمات المميزة المتواجده فى الاسواق والتى تتم على حسب رغبه واحتياج عملاءنا الكرام وهناك عدد من الخدمات التى لابد من القيام بيها وهى التلميع والتعطير بجانب التنظيف لكى يتم الشعور بالتميز فاذا اراد ان تقوم بكل ما تتمناه فعليك ان تتصل وتتواصل معنا على الفور . NYC Movers and Packers is the best full administration moving organization. We are authorized and safeguarded. Our solid movers give nearby and long separation moving administrations. Here are administrations accessible for the mover, movers, moving organization, moving work, moving administrations and moving work. We are giving the best administrations in exceptionally sensible costs. We are proficient in moving administrations with prepared work. Thank you for the post. I am in Christchurch and Ac Auto Electrical people were of great help. They helped me in every possible way. شركة الاتقان المثالية واحده من اعظم الشركات فى تنظيف المنازل والفلل حيث تمتلك فريق عمل مدرب على اعلى مستوى وتقدم للعميل افضل جودة وايضاً تتميز بأرخص الاسعار كما تقدم للعميل ضمان بالخدمة حيث اننا لدينا خبره تفوق ال 25 عاماً فى اعمال التنظيف واعمالنا تكون فى الدمام والخبر والجبيل والاحساء وجدة وسيهات وبقيق وصفوى وعنك وام الساهك والظهران ورأس تنورة والجبيل الصناعية وغيرها من مدن المنطقة الشرقية . انها من افضل الشركات الرائدة فى النظافة العامة حيث الكفاءه والدقة كما تقوم برش الحشرات التى ممكن ان تتواجد ببيتك او رش البالوعات لكى لا تكون سبب فى تسلل الحشرات الى داخل المنزل حيث ان هدفنا هو ارضاء العميل وراحته ولذذلك نقدم له كل سبل الامان والراحة . It is amazing and wonderful to visit your site. I've learn many things from your site. Hire the services of Cheap Removalists Melbourne today for any kind of relocation. Well then best removalists like Movers4melbourne should be your first option. thank you for the useful post about relocation. Find Cheap House Movers Melbourneoffer you best moving services at affordable prices in Melbourne. Book experienced house movers in Melbourne Today. Check their website, you will be happy with their service!